A far greater example of Unity Solved and Delivered than any I have so far mentioned is found in the teaching of S Paul in his Letter to the Ephesians. Part of that teaching is found in the Epistle of the Votive Mass for the Ending of Schism aka for the Unity of Christians. 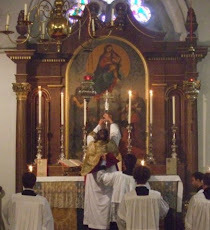 My own hope is that this Mass, beautiful in its profundity, will be widely available during this Chair of Unity Octave. But I would urge that readers reappropriate the entirety of that great Epistle (there is a very fine major Commentary of gigantic size by Thomas Winger). S Paul deals with the the most profound division imaginable: between being within God's chosen People or outside it. He alludes to the soreg, the wall that separated Gentiles from Jews in the Temple at Jerusalem, marked by its rather chilling inscriptions threatening death to Gentiles who disregarded it. That wall, S Paul points out, is abolished and, instead of Jew and Gentile, we have the new One Creation which is Christ. In this Chair of Unity Octave, we must renew our commitment to oppose anything which strives to build that wall up again. The Faithful Remnant of Israel, so major a theme among the Prophets, is the one Body of Christ, together with those saved from among the Gentiles, snatched out of Gentile impurity and anomia by that fontal Act of Faith which Abraham made. I think one of the weaknesses in the Church of today is that so few of her members are of Jewish descent. What we lose from this is a firm sense of our essential rootedness in the discipline of narratives handed down from the past, and an awareness that identity needs to be expressed by visible markers which distinguish us from the unclean pagan world around us. And just suppose there were a strong Jewish presence in the Church, of intelligent and focussed Jews who understood that the Fall of the Temple and the cessation of its Daily Sacrifices is a coin which has, on its other side, the Daily Sacrifice of the tamid Lamb who is the Incarnate Torah. Perhaps we would not have such a dearth of sacrificial awareness among the mainstream congregations within our poor impoverished Latin Church. The sad truth is the Fathers at Vatican Two arrived there exhausted with and tired of the Roman Rite and so they prostentatised it as much as they could and now you could not find one in one hundred million Catholic (priests included) who could tell others what ABS just did vis a vis what the aspects on the Daily Holocaust are. The One True Holy Roman Catholic and Apostolic Church requires the fullness of truth. Period. I really like the different talks by Dr. Brant Pitre which explained the Jewish background of New Testament passages and the Church's liturgical practices. I can testify that my Faith has been enormously enriched by marrying into a large Jewish family, my wife being the only convert to Catholicism (before our marriage).